All the staff at CMC try very hard to provide the best treatment for all patients irrespective of their ability to pay, but sometimes compromises have to be made. A 29-year-old cobbler like the one in the picture had a swelling over his thigh for about 8 years. This had grown slowly, and some years earlier it was tested at another hospital by a needle aspiration which did not report any cause for concern. He wanted it removed as it continued to grow, and was uncomfortable when he sat cross-legged on the floor to do his job as a cobbler (see picture). The surgical team led by Dr Parvez Huqq, was suspicious that this could be a malignant tumour. Ideally this would have required an MRI scan and another tissue biopsy, but the patient could not afford these. So in agreement with the patient, the tumour was removed completely under a local anaesthetic, on the understanding that if the biopsy was ‘nasty’ then he would require a bigger operation. Unfortunately, the biopsy showed a Low Grade Soft Tissue Cancer (Fibrosarcoma), which the ‘Tumour Board ‘ agreed needed to be removed properly in margin and depth. This was done under general anaesthetic leaving an 8-9 cms residual defect. A similar amount of skin and soft tissue was moved from the adjacent area to cover this defect (a skin graft). The final biopsy confirmed that the entire tumour was removed with adequate margins. He went home on the 3rd post-operative day with weekly review, and resumed work in 8 weeks. In India the average monthly gross national income per capita, purchasing power parity (PPP) is Indian Rupees (INR) 34845, (£400). 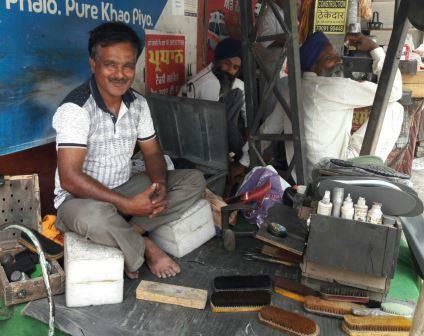 As a cobbler our patient earned INR 5,000 (less than £60) a month, and supported his non-earning wife and two school aged children, equating to INR 1,250 (£15) per capita per month. Like most patients he did not have medical insurance, and he lost 8 weeks earning during the treatment. The ideal treatment of a Core Tissue Biopsy, Immunohistochemistry, MRI and staging CT scan would cost an additional INR 38000 (£440), while the two surgeries cost him INR 53760 (£630) saving 40% of the total expenses, amounting to 7 months earnings. If you would like to help patients like this pay their medical bills, please make a donation now.